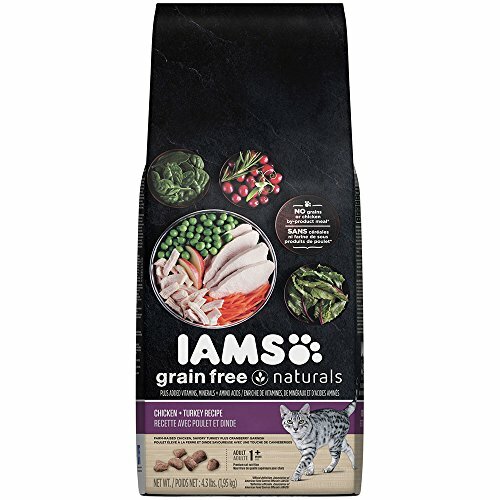 One of the most popular pet food brands in the world, IAMS has recently revitalized its entire line of dry and wet cat foods to make them healthier and closer to your cat’s true diet. Take a look at the following products to see which one is best for your feline’s health and well-being. Support your kitty’s carnivorous diet by feeding them this IAMS Grain Free Naturals cat food. It comes in three bag sizes of 4.3 lbs., 6.5 lbs., or 11.2 lbs., and two formulas – chicken and salmon or chicken and turkey. Chicken - Wild cats and the “big cats” eat plenty of birds as part of their natural diet, so feeding a domestic cat chicken is giving them their natural diet. Vitamin E - Give your kitty this IAMS Grain Free Naturals, and your cat will have a lustrous coat of fur thanks to the Vitamin E in this formula. This formula is also good for older cats who are ages 10 and up. Some cat owners say this IAMS Grain Free Naturals cat food is hard to find in stores and might be discontinued soon. 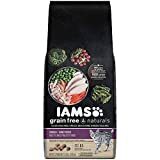 Inexpensive doesn’t have to mean cheap, and this IAMS Grain Free Naturals Cat Food won’t break the bank or hurt your cat’s health. In fact, it will improve it! Just like humans, cats need excellent dental care to ensure their teeth are healthy and strong. Tooth problems can contribute to digestive issues. This IAMS Proactive Health Oral Care keeps your kitty’s teeth clean and is fortified with calcium, too. Calcium - Calcium is the best mineral for strong, healthy bones and teeth, which are essential for the overall structure of your cat’s body. 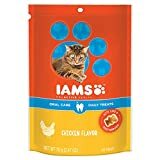 Unique Kibble Shape - This excellent IAMS Proactive Health Oral Care food is shaped with a unique texture to help clean teeth and prevent both plaque and tartar from building up. While chicken is the first ingredient, this IAMS cat food also contains corn meal and corn grits, neither of which are good for cats. Has your kitty struggled with tooth problems? 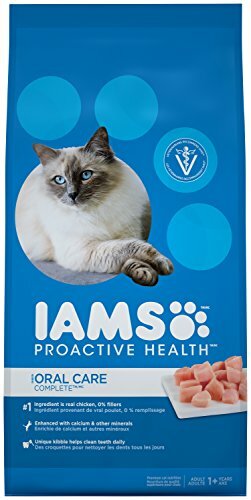 This IAMS Proactive Health Oral Care Cat Food is one of the few brands on the market that specifically targets feline dental care. With no grains as useless fillers and packed with plenty of protein from salmon, this IAMS Healthy Adult Perfect Portions will quickly become your cat’s favorite. It’s enriched with Vitamin E for an immune system boost, too. Twin-Pack Design - You get two for the price of one with this uniquely designed twin-pack of foods. It’s also portioned out just right to keep indoor cats’ weight down. Fish Oil - In addition to actual salmon, this wet cat food also contains fish oil, which has essential fatty acids for a healthy heart. This wet cat food contains added color, so it is not all natural. Some brands have no added or artificial colors and flavors. 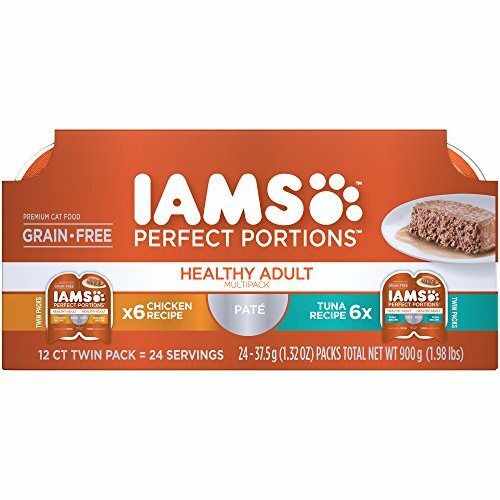 Many cat owners have been really pleased with this IAMS Perfect Portions Healthy Adult wet food, since their cats love it! It’s all too easy to overfeed a cat, so owners also appreciate the portion sizes. Not only should you be concerned with the ingredients in bagged cat food, but also in cat treats as well. These IAMS Proactive Health Daily Cat Treats are not only flavorful, but help improve your cat’s health, too. Hairball Care or Oral Care - Whether your cat has a lot of hairballs or they are struggling with tooth problems, these IAMS Proactive Health cat treats come in two varieties. Chicken or Salmon - In addition to choosing which type of treat to get your cat, you can also pick the flavor from chicken or salmon. These treats contain ground corn and Brewer’s rice, both of which have been proven to not be good nutrients for pets. These cat treats also have health benefits, which will help prevent hairballs or dental problems. They also support a smooth digestive tract and are very flavorful for cats. There are so many different types of wet cat food on the market, so how do you find the best for your cat? Well, when you choose IAMS Purrfect Grain Free Adult Wet Cat Food, the answer is easy because it’s formulated with all-natural ingredients. Flaked Fish - Fresh, flaked fish is the primary ingredient in these IAMS Purrfect Wet Cat Food tins. Cats are carnivores, so feeding them a protein rich diet gives them optimum health. Grain Free - Wild feline species don’t ever eat grains, so you don’t want to feed them to your household cat! They would clog up the digestive tract and create health problems. Comparing ounces to ounces, wet food is more expensive than dry kitty kibble and bagged cat foods. Many cat owners have been astonished and delighted to see that their cats absolutely love this IAMS Purrfect Grain Free Adult Wet Cat Food. With three seafood flavors and plenty of protein, it’s a nutritious and delicious choice for felines. Since IAMS has gone more natural with its cat foods, owners have been raving about how healthy their cats are. Plus, you can definitely lower your vet bills, too, by keeping your cat’s teeth clean by using Proactive Health Oral Care food or by reducing hairballs with the Proactive Health Daily Cat Treats for Hairballs. Feed your feline IAMS!